The Individuals with Disabilities Education Act (I.D.E.A.) is the United States special education law which ensures that children with disabilities have access to a free and appropriate public education. Part C of this legislation provides funding to individual states for early intervention programs for infants and toddlers. Part B of this legislation provides funding to states to meet the needs of children ages 3-21 years of age. If your child is younger than 3 years of age, contact your local early intervention program. The National Early Childhood Technical Assistance Center contains a contact list for Part C coordinators for each state (www.nectac.org/contact/ptccoord.asp). No referral from a medical professional is required to access these services. Following an initial contact, the state has 45 days to conduct an assessment of the child and complete an Individual Family Support Plan (IFSP). The types of services rendered will likely vary by geographic region. If your child is between the ages of 3 and 21 years of age, contact your local school district. The school district will conduct the necessary evaluations and with you will develop an Individual Education Plan (IEP) to meet your child's unique needs and prepare them for further education, employment, and independent living to the maximum extent possible. An inherent conflict of interest exists with school-conducted assessments as the school system is responsible for providing services to remedy the challenges that they have identified in their own evaluations. 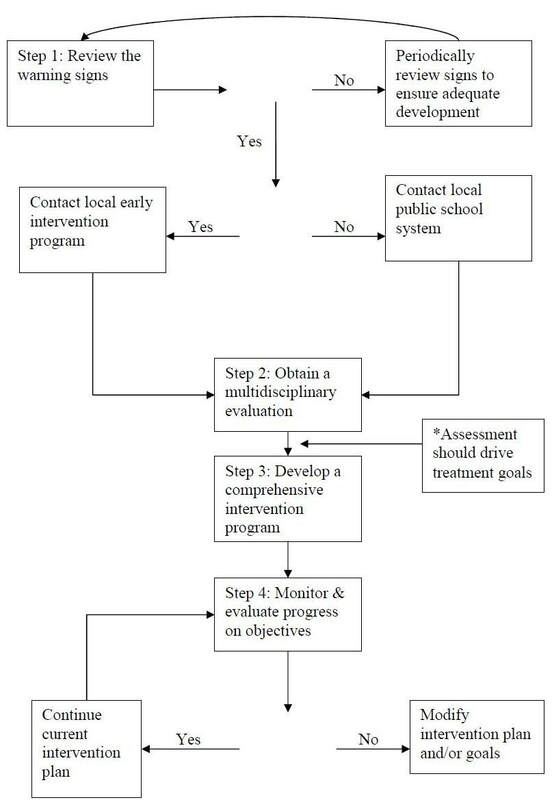 Therefore, many families prefer to consider supplementary assessment and intervention programs. Very often, this option is at the families own expense as few insurance companies are funding assessment and intervention programs for children with communication and learning disorders. A team of individuals from different disciplines is strongly recommended to provide a complete picture of the child's level of functioning. For more information on the various disciplines that comprise such a team, proceed to Choosing a Professional.